​VOW Camp is a series of seasonal skill development weekend retreats open to women of all ages and abilities – from 18-year-old daughters to great-grandmothers. Each woman signs up for four skill development workshops throughout the weekend. We offer VOW Camps for two seasons: winter and fall. VOW Camp provides educational and skill-building programs in virtually all outdoor activities, including archery, firearm safety, chainsaw safety & skills, hunting skills, fishing, orienteering, GPS, canoeing & kayaking, snowshoeing & cross-country skiing, search & rescue, wildlife photography, dog sledding, rock climbing, winter camping, wilderness first aid, self defense, mountain biking, wild medicinals & edibles, forestry and more. 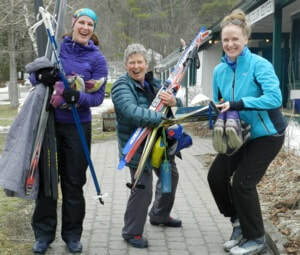 Happy skiers at VOW 2018 winter camp. 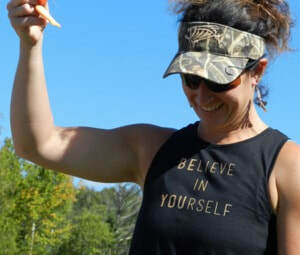 Fishing instructor Cheryl at VOW 2018 fall camp. Chainsaw class at VOW 2018 fall camp.